FULL TIMEEssendon win a tight match in Western Sydney, they found it hard to shake a determined Giants' side who took it up to them all night, they will however be sweating on Watson's injury. GOAL GIANTSTreloar kicks his third goal just seconds before the siren sounds, he has been dangerous all night and it is just rewards for a good game. BEHIND BOMBERSStanton with a late snap on goal sends the ball skidding through the wrong side of the posts for a minor score. 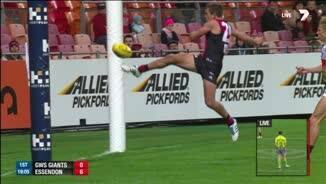 BEHIND BOMBERSDaniher with a towering mark on the forward flank, if he converts this it is good night for the Giants, he pushes it across the face. GOAL BOMBERSFrom the stoppage Ryder pushes the ball to a team mate who in turn lays it off to Stanton who kicks the running goal. That may be enough for the visitors. A chance for the Dons as Chapman tries to haul in a kick into the Bombers' attacking 50, however running with the flight he just can't gather the ball and it spills out of bounds. Dempsey with a nice mark deep in defence as he was running with the flight of the ball, he quickly switches play and the Bombers are out. The Patton miss may prove costly, it was easily a kickable goal. BEHIND GIANTSPatton is caught behind the pack and luckily the ball comes off hands and drops in his lap, he turns and runs towards goal before slewing his kick off the boot for a point. GOAL BOMBERSChapman thumps the ball out of a ruck contest and it falls into traffic, Hocking runs past and scoops up the ball before driving home the goal. INJURY BOMBERSWatson has hobbled off and is in the hands of the trainers, let's hope it is nothing serious. GOAL BOMBERSChapman starts the run on the half back line and it ends with a mark to Joe Daniher 40 out, Daniher goes back and kicks the goal to give the Bombers' some relief. Bombers InterchangeJobe Watson and is possibly out for the game. Giants InterchangeAdam Kennedy off due to an injury. 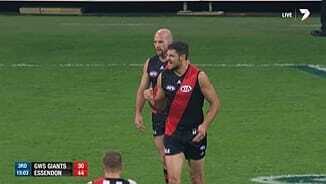 Bombers InterchangeHeath Hocking off due to an injury. Giants InterchangeCurtly Hampton and is possibly out for the game. Welcome to Spotless Stadium for the GWS Giants v Essendon Round 12 clash. ESSENDON'S unconvincing season continues, stumbling its way to a 15-point victory over Greater Western Sydney that leaves the Bombers stuck outside the top eight at the halfway mark of the year. The visitors did just enough to secure an 11.15 (81) to 9.12 (66) victory at Spotless Stadium that improves their record to 6-5 ahead of next week's clash with Melbourne at the MCG. But the heavy favourites had to scratch and claw all night to get the better of the upstart Giants in a performance that does little to indicate they are a genuine finals threat in 2014. It was an encouraging display from the home side, however, which took another step towards burying the memory of its dreadful defeats to West Coast and Richmond by a combined 224 points. GWS bounced back from those horror shows with last week's narrow loss to Hawthorn at the MCG, maintaining that type of form with a combative showing on home soil on Saturday night. The Giants threatened a major boilover when they kicked three straight goals midway through the final term to close to within a solitary point. Yet the Bombers were able to steady and just run out winners, despite a hip injury to skipper Jobe Watson in the final term that is likely to keep him out for around a month. 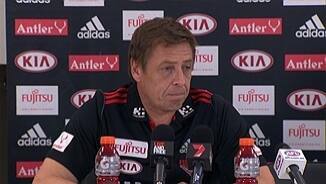 Despite the nature of the performance, Bombers coach Mark Thompson felt his side was always going to prevail. "It's just your gut feel for what your players are capable of and what you've seen them do before," he said. "We would've liked to have been 100 points in front, but we weren’t. "We have good days and bad days. "We weren't jumping out of our skin and when that happens, it's good to win still. "I don't become super critical and over analyse little things." 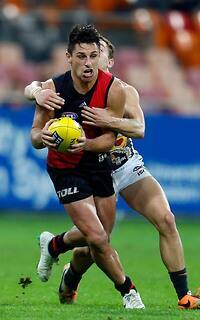 David Zaharakis was brilliant for Essendon, vying with GWS veteran Heath Shaw for best-on-ground honours. Watson, Dyson Heppell and Brendon Goddard were also prominent, while Joe Daniher was wasteful in front of goal, finishing with 3.4. Shaw was outstanding in defence for the home side, with Shane Mumford tireless in the ruck and Callan Ward, Devon Smith, Adam Treloar and Dylan Shiel leading the way through the midfield. Treloar led the GWS goalkicking with three. It was a hotly contested game from the opening bounce, with GWS debutant Rory Lobb lining up on 388-gamer Dustin Fletcher in surely one of the biggest disparities in experience the competition has seen. But the rookie was up for the fight, taking some strong grabs and nailing a set shot with his first kick as the home side got off to a strong start. Greasy conditions had players regularly losing their footing, but it was a willing opening term, which ended with the Bombers kicking three goals to GWS' two. There were plenty of turnovers, but both clubs were up for the fight. GWS kicked the first two goals of the second term to get its nose in front for the first time before the visitors lifted late, taking a 10-point advantage into the main break. 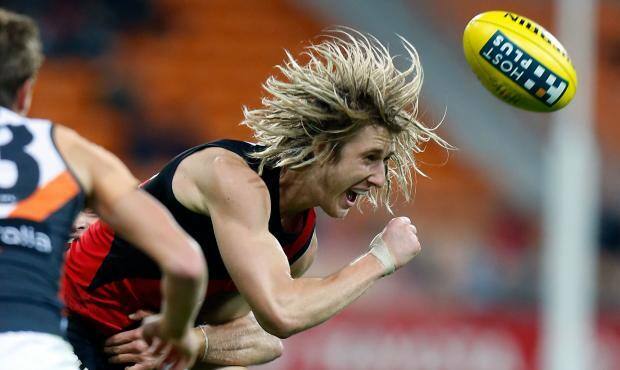 Essendon then managed to lift another notch in the third term, finally earning some scoreboard pressure and taking a 20-point lead into the fourth quarter. There was some feeling just prior to the penultimate siren, with Davis Myers throwing a cheeky, totally unnecessary elbow at Devon Smith, sparking a melee during the break. 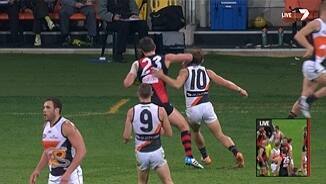 It will get looked at by the Match Review Panel, but Smith did appear to make the most of minimal contact. 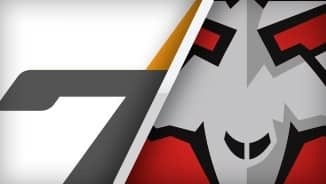 The Giants then got on a roll early in the fourth quarter as the upset burst into view, yet it was the more experienced Bombers doing just enough to seal the four points. 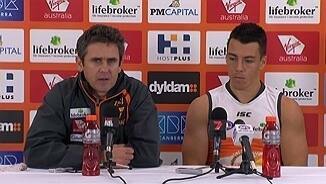 Afterwards, GWS coach Leon Cameron couldn't fault his side's effort and intent. "We all want to win games, but as I said to our players after the game, I'd prefer to have effort than composure at this stage," he said. "It was probably a bit of composure in the last quarter where we were going inside 50 and threatening to take the lead where we needed to make some better decisions. "But our effort was just first class."